The DashDrive HV610 from Adata is a portable 1 TB external hard disk, which lets you carry all your digital files in style wherever you go without the need for external power sources. Stylish and Compact This compact and lightweight hard drive features a removable smart cover in a puzzle design, which also provides you with a convenient and novel way to store the USB cable. Fast Connectivity The USB 3.0 connectivity of this hard disk gives you the freedom to transfer data quickly and efficiently from and to the drive. Moreover, it also makes it compatible with a variety of other USB 3.0 and 2.0 devices. 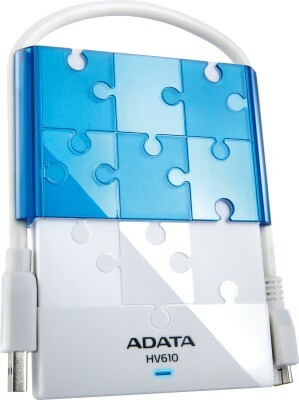 LED Transmission Status Indicator The LED display light on this portable hard drive easily intimates you about the status of the file transfers..The product Adata HV610 2.5 inch 1 TB External Hard Disk is from the famous brand Adata. The product is currently available with the amazing discount from FlipKart.Currently a discount of 41.0% available for this product. Great discount for this product which has the original price of Rs.7020.0 and you get these amazing products for a discounted price of Rs.4100.0. Hurry up. Stock may be limited.